Arthritis pain affects you differently than other types of aches and pains. 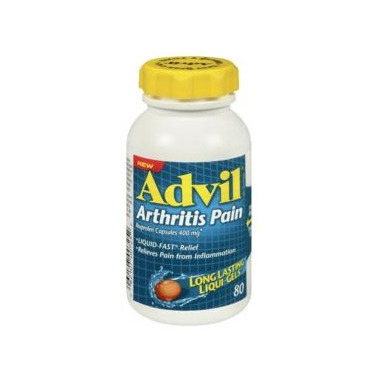 That’s why there’s Advil Arthritis Pain long lasting Liqui-Gels for liquid-fast, effective relief of your arthritis pain. By targeting the site of inflammation, Advil Arthritis Pain goes right to work at the source of your pain – so you can make the most of your day. D&C yellow no. 10, FD&C green no. 3, FD&C red no. 40, gelatin, lecithin (soy), medium chain triglycerides, pharmaceutical ink, polyethylene glycol, potassium hydroxide, purified water, sorbitan, sorbitol. For fast, long-lasting (up to 8 hours) and effective relief of pain from inflammation associated with arthritis. Adults and children over 12: Take 1 Liqui-Gel every 6-8 hours as needed. Do not exceed 3 Liqui-Gels in 24 hours, unless directed by a doctor. Keep out of reach of children. This package contains enough medicine to seriously harm a child. Do not take Advil if taking daily low dose acetylsalicylic acid (ASA, 81 – 325 mg), without talking to a doctor or pharmacist. Do not use with ASA, other ibuprofen or pain relief drugs, or if allergic to ibuprofen, ASA, salicylates, anti-inflammatory drugs or any of the listed ingredients.